Want a friend and good health? Get a pet. Well, who doesn’t need a friend? Who doesn’t need a lot of friends? Here is my friend, CoCo, a 5-year-old Schnoodle (schnauzer poodle mix), who runs to the door when I come home, no matter what time, doing her dance, before running to the couch where she expects me, no matter what time, to pet her and tell her she is the best. She then stays at my side on the couch until I shut the light off in our family room, after which she runs and jumps into bed. Every morning when I walk to the kitchen, CoCo jumps around me like it was the return of a long lost pal. CoCo is known by everyone who comes into the Popovich house, where she greets them with the same happy and playful dance. Talk about first impressions and service excellence! The second picture is our family’s newest addition, MoMo, also known as Mr. Mo, Uncle Mo, and a number of other spontaneous names. 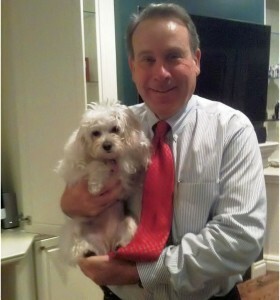 He is my daughter Chris’ toy poodle, and he has assumed the same act when I get home. He also has added chin kisses to CoCo’s routine. 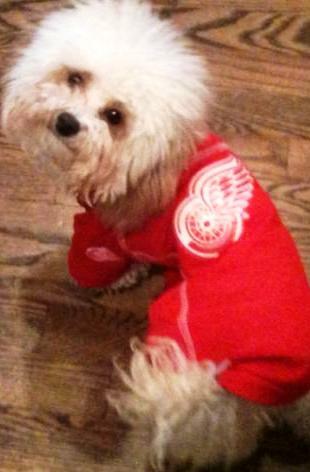 Both CoCo and MoMo like watching the hockey games and the NHL network , and are particular fans of the Red Wings. CoCo favors Nick Lidstrom, while MoMo continues to root for the recently retired Mike Modano. Both prefer the NHL go to a bigger ice surface. How does this relate to health? The Centers for Disease Control and Prevention have a great piece on its website about the benefits of pet ownership, including the science that pets can decrease your blood pressure, cholesterol levels, triglyceride levels and feelings of loneliness. Pets increase our opportunities for exercise and outdoor activities, as well as opportunities for socialization. Therapy dogs provide affection and comfort to patients. The first therapy dog reportedly was Smoky, a Yorkshire terrier abandoned on the battlefield in New Guinea and found by Corporal William Wynne. When Wynne was hospitalized for jungle disease, Dr. Charles Mayo (yes that Mayo brother) allowed Smoky to go on rounds and sleep with the recuperating Wynne. Smoky remained a therapy dog for 12 years. Recently, some 14 stray dogs rescued by US service members were reunited at JFK Airport. These dogs that were rescued from Afghanistan are often credited with performing their own rescue mission there. Well, my CoCo is a friend, provides me with affection and comfort, warms my heart, and reduces my stress and blood pressure. I am sure you have similar stories of friendship and health. I would love to hear and see them, so please share in the comments section below. This entry was posted in CEO, Detroit and tagged Afgahnistan service dogs, Afghanistan, CEO, CEO blog, Detroit, Doc in the D, docinthed, Dogs in Afghanistan, Dr. Popovich, Health benefits of dog ownership, Hospital CEO, hospital employees, John Popovich, Pet Health Benefits, Pet Therapy, Schnoodle, Therapy dog, Zachary Henning by Dr. John Popovich. Bookmark the permalink. I have two black labs that have gone with me to visit family members in nursing homes for years. I have seen them bring such joy and life to those who have very little. One nursing home that we visited, for several years, had a resident that walked the halls continually, never speaking or ever showing a facial expression. Bo the larger of my two dogs, deceided that he was not going to ge ignored any more. He walked along side the woman, scrunched down under hand, which was close to her side and made her pet him simply by walking past her. In that brief moment-she BEAMED! Then as soon as he passed, the smile was gone. She never spoke, but for that split second she felt joy. I will never forget the look on that patient or the countless other faces of joy my two big “loves’ have brought to others. They are a gift like no other. Thank you for your wonderful post about CoCo and MoMo, Like you, our family has a schnoodle, Oscar. Our kids tell me and my husband that he is the favorite child. He brings joy and fun to our home each and every day. A quiet walk with Oscar through our neighborhood woods brings my stress level down like nothing else. Oscar loves riding in the car, bacon and my son’s familiar whistle when he comes through the door. He’s the best therapy in the world. I have three little dogs, all from Last Chance Rescue, who greet me with a dance when I get home. But, one little dachsund also brings me a floppy, well-loved toy from his basket. I love these dogs and look forward to everyday with them. If people would only truly look at the value of a animals presence in this world they will see that not only their physical but their mental and their spiritual well being could and would be transformed; All my life I have loved and known the quality that animals have that people dont have. Animals no matter how they are treated by humans they are non judgemental, they are not greedy, they are not backstabbers, they are not prejudice, they are not envious, they are not power hungry and they certainly are not egomaniacs and they never hold a grudge even if they are abused by humans! They speak to us with their hearts and their eyes, they are always grateful, they are always loving, there is not a mean or evil bone in their bodies and if there is it is only because a human trained them that way.You take a mean animal out of that environment and you will see that with love and re training they are rehabilitated..there are no mean animals only mean people! I could go on and on but I always say and have said when I hear people say “oh they act like animals” I always come back and say, “if only the people in this world acted more like animals it would be a kinder ,more loving,and a grateful ,peaceful world”. My family has always adopted abused ,neglected animals, the throw away animals the shelter animals and we always spread the message to adopt from the shelters. and if people do, your heart and soul will certainly be the better for it, the magnet on the back of my car says it all…WHO RESCUED WHO! Thanks so much, Dr. Popovich, for the awesome morning smiles! When my mother-in-law had a stroke last year but thought she was just coming down with a stomach bug, it was my sister-in-law’s dog’s behavior that tipped everyone off something more was wrong. Dooger, an English lab, didn’t leave her side in the bed the whole day. (He ordinarily doesn’t snuggle with my MIL.) Her own dog is being equally protective of her these days since she broke her ankle in three places. She is couch-bound until her surgery later this week and her American Eskimo won’t let us get too close to her (warms the heart, but very annoying). We have a beagle-coonhound rescue who is very vocal when we come home everyday. I love her, “Hey! You’re back!” howl coupled with her frantic tail-wagging. It’s the highlight of my day. It’s hard to be grouchy when we all get home after being greeted by her! Thanks sharing your lovely pets….interesting I was watching Dr. Oz the other day and he again mention the benefits of having pets…I have a Shuzpoo (Purity) my little snowball whom my family adores…she too run to me as soon as I get home to greet me with her dance…my family and I call it the two step dance she stands up on her two feet and wave her hands (my kids say:). I agree having a pet dog has truly changed my family life. I have hypertension and noticed my levels has decreased through tout the year. I would not trade her for the world we all enjoy her!!!! I’m currently the fortunate owner of 4 small/semi small-dogs; a poodle and 3 mixed breed; best friends and what I consider furry kids, 3 of them are rescues. I will never ever forget my late dog Buffy, another rescue (gone 3 years 12/26) and the comfort she provided to me. Buf had her shy moments and was not considered small like the dogs I have now, She was a 40 lbs scruffy terrier mix I adopted from a rescue league. She had come to them after an abusive male owner beat her. I had the job of teaching her love and gaining her trust. About 5 years of having her in my life, I had major surgery and was alone at home most of the time during my recovery. She would come to my bed when I was most ill and allow me to use her as a pillow to rest my head on along with holding her in my arms for comfort, something I would have never expected her to do, but she did. I wouldn’t have made it it she hadn’t been there during the pain and loneliness. I will always believe as a result of my rescuing her from a difficult life, she rescued me in my time of need. I hold her memory dear in my heart and always keep her collar on the mirror of my car and a picture at my desk in her memory. The saying ” dogs love you unconditionally” is so true. Despite their varied personalities and sometimes bad habits, they put up with mine too! As the holidays come upon us I’m thankful for Ted, Jack, Pooky and Max, my canine family.